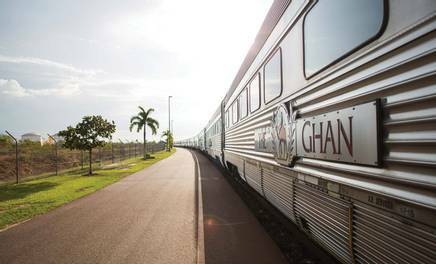 Promising access to parts of Australia that no other holiday can come close to, a rail journey onboard The Ghan is the perfect balance of comfort and adventure. Whether you want to enjoy the comfort of your private cabin, lose yourself in conversation with newfound travelling companions, or simply gaze out of the window admiring ever-changing landscapes, The Ghan caters for all. 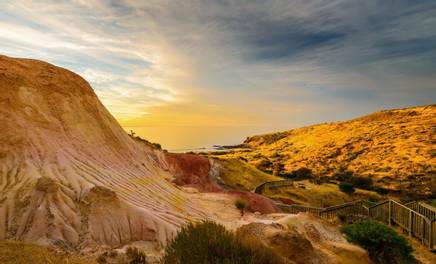 The real adventure begins as you step into the rich creative soul of Australia, with all short stops and excursions included in your holiday. The dramatic scenery and awe-inspiring landscapes create an unforgettable experience that will move you in every sense of the word. To see all our amazing Ghan rail offers, click here. The choice of adventure is just the beginning! Once you’ve chosen your adventure, prepare to be blown away by your onboard experience. With a choice of a Platinum or Gold Service Cabin, you can leave your credit card safely tucked away knowing that all food and beverages are included. 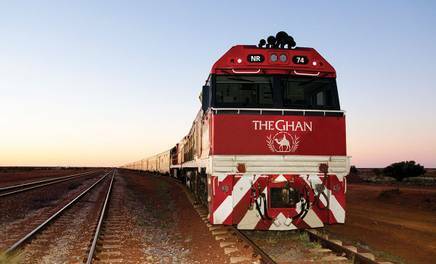 To learn more about the levels of service offered on board The Ghan, click here. As the perfect place for travellers to come together, the Outback Explorer Lounge plays tribute to the explorers who ventured beyond the known and into the vast outback wilderness. The Outback Explorer Lounge is centre of the train’s activity. Here, you can enjoy a wide range of all-inclusive refreshments while spending long hours can be spent socialising, snacking and catching glimpses of passing wildlife through wide picture windows. Adding another exciting dimension to your journey, off-train excursions give you a chance to breathe in the beauty you’ve been watching pass by. Be taken into the heart of Australia with a range of short stops including visiting the beauty of Katherine, explore the flora and fauna of Alice Springs and admire the stunning sunrise on an outback backdrop in Marla.